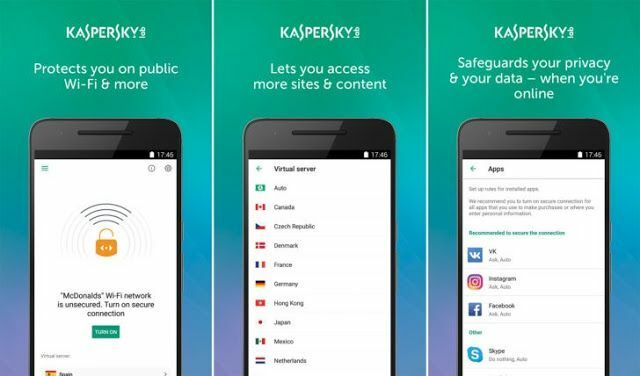 Kaspersky Secure Connection service allows you to connect to the Internet safely and protects your privacy, by encrypting all data sent and received through the network. 200MB of daily secure traffic is included and free of charge and 300MB per day (if application is connected to the My Kaspersky account). When you want to get connected to public WiFi network & surf the Web, Kaspersky Secure Connection automatically offers to connect you via Virtual Private Network (VPN) technology – so others can't see what you're doing and you can safely go online… in privacy. Whether you're online banking, shopping, video streaming, socialising or dating via the VPN service, we guard your privacy and make sure hackers can't read your communications. All data you send & receive is transferred via an encrypted, secure channel – and your location and IP address aren't revealed. Because your location and your IP address aren't revealed through the VPN service, it's easier for you to access websites and content in other regions – without being traced. Kaspersky Secure Connection won't log what you're doing online and won't keep any records of which websites you visit. Play content from all over the world. If you are getting “This content is not available in your country”? message , or your ISP is blocking other web sites. No worries! SecureLine VPN will browse the web with another IP and and look like its connected from a different location, allowing you to view ‘almost any content’ anywhere. VPN tunnel available via the U.S., United Kingdom, Germany, the Netherlands, Czech Republic, and Singapore.